No excuses I just haven’t been writing as often as I should. BUT I did get married. 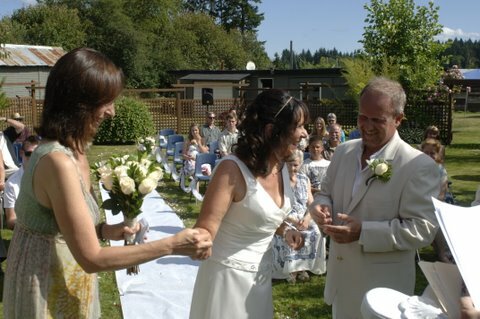 Yes, Karey Hope and I got married on July 30 at 4pm in the back yard of the home where I grew up in Duncan, British Columbia, Canada. Karey and I did most of the planning of this event and it took up most of our time for May, June and July as well as doing the work we do with Dyslexia and this website and blog. We had in-laws and relatives from as far South as California, and as far west as Denver Colorado. It was a lot of fun and took a couple of weeks to finish visiting family and friends. We hope to post some photos on our website, as soon as we get them organized. Karey and I do a lot of research on Dyslexia and Right Brained learning styles and we find lots of great information and we come up with our own ideas too. Earlier this week I started reading the book; “Right-Brained Children in a Left Brained World” and it is fascinating. 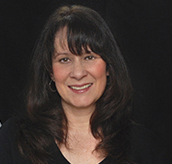 The author, Jeffrey Freed MAT, is an educational consultant who has tutored and helped thousands of ADD and Gifted students. This book is interesting for me for a couple of reasons; it is written in a fashion that makes it a joy to read and it says so much of what we believe. We are learning that there is a lot more in common with ADD, Dyslexia and other learning “disabilities”. Jeffrey makes it clear that being very Right Brained leads to all kinds of learning issues. These learning problems are just behaviours that are the result of being taught in a fashion that is inappropriate to Right Brained students. The problem with these children is not with how they learn but rather how they are taught. Karey and I have mentioned in earlier blogs that one of our goals is to update our books to reflect the new knowledge we are gathering in our research. We do intend to do that in the near future but after reading Jeffrey Freed’s book I realized we have a resource available right now that can be used as a teaching template for Right Brained learners. 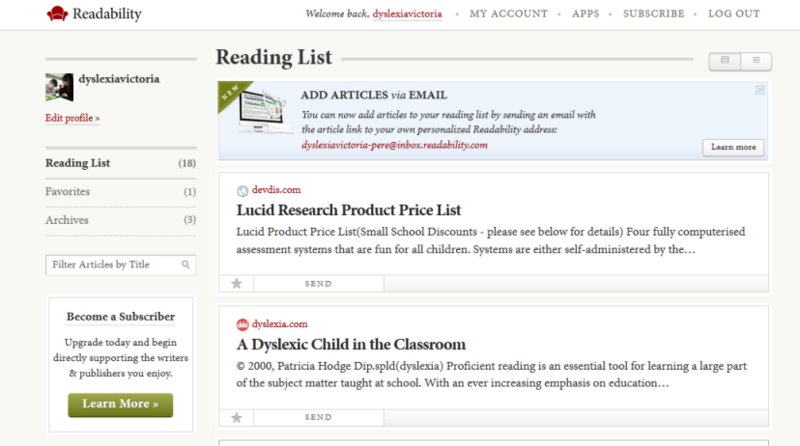 The methods we recommend for Dyslexic students are also going to be very useful for ADD students. 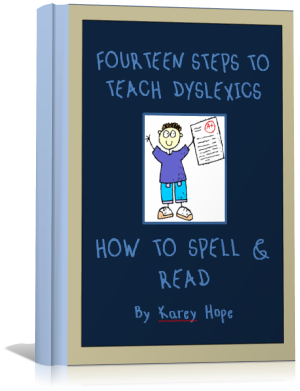 Along with the many recommendations and resources we include in the teaching programs we create for our clients there is a section we call the “14 Steps to Teach Dyslexic Students how to Spell and Read”. Parents and teachers have told us that the “14 Steps” is so effective as a teaching tool that they have had tremendous success with it by itself. We are going to incorporate it, along with other methods we have discovered, researched and tested, in the soon to be updated books we publish but we believe it is important to offer it now. So, for parents and teachers who would like a resource that is simple to use and requires no additional training or materials to help with their Right Brained learner we are offering it right now. “14 Steps to Teach a Dyslexic to Spell & Re ad”. I hope I haven’t presented this as a sales pitch just to sell our products because that is not our goal here. As we have said a couple of times our aim is, and always will be, to get you the best information to help you succeed, not just to make a buck. When I read this short manual,”14 Steps” Karey created I realized that these resources need to be presented to parents and teachers now. When we have workshops we always ask the question, “What do you think Dyslexia is?” The answers always start with, “backwards letters like “b” and “d”. Often this is all people are aware of. Most children reverse and turn letters upside down until about grade three. This is a directionality issue. “Directionality” for a person is the understanding and awareness of where left, right, up, down, above, below, etc. are in relation to where they are standing or sitting at a given point in time. Many Dyslexics have difficulty with their awareness of direction and often experience it their whole lives. “Directionality” is also understanding directions for writing tasks such as “write your name in the top right-hand corner,” “draw a line under the word ______,” “draw a picture of yourself in the middle of the paper”. This confusion also extends to letters like b and d, n and u, p and q, m and w, any numbers with two or more numbers like 21 and 12. Some also write backward, from right to left and/or the letters appearing like ordinary writing seen in a mirror. There is a little trick that often helps the Dyslexic student figure out which way their troublesome letters such as “b” and “d” go. The letters are normally written in black text. This makes letters that are the same shape such as b, d, p, q hard to differentiate from each other. The children we work with often ask why these four letters are all the same shape. The solution we use is colour. Dyslexics respond well to colour and by colouring the letters specific colours or making them out of coloured Play Doh or modelling clay they can differentiate them from each other more easily. 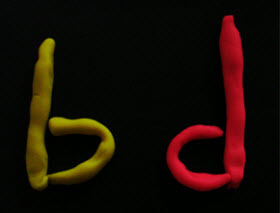 By making them out of Play Doh or other modelling mediums you help the child to kinesthetically “feel” the letters which helps them internalize the directions and shapes of the letters. Also provide a cheat sheet for them to look at with the letters coloured. We suggest laminating a copy for their school desks and at home. With these teaching methods and aids they will soon have the direction of the letters right. These kids are very visual and will generally commit these coloured images easily to memory. Note: Make sure you use the same colour for each letter all the time. Otherwise they can get confused.